I’ve already reviewed Peggle for iPod ( ), but it’s worth noting that Peggle is also available for the Mac as Peggle Deluxe. 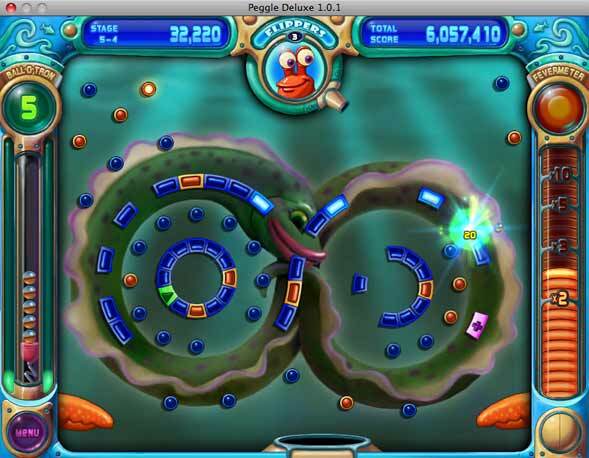 If you haven’t been bitten by the Peggle bug, now’s the time—for $20, Peggle is one of the most addictive casual games on the Mac. Peggle Deluxe is a bizarre mixture of the Japanese pinball game Pachinko and Bust-A-Move, a popular color matching arcade game that goes back to the late 1980s. In Peggle, you have to make orange-colored pegs disappear by rebounding a ball that you fire out of a cannon. You don’t have any direct control over how the ball falls; instead, you take careful aim with your cannon and hope that the ball will hit its intended target. Each new level reveals a new puzzle, and as you progress through the levels you meet new characters called Peggle Masters. Each Peggle Master has a special power. For example, one is a lobster and when you activate his powerups, you’ll be able to use claws at the bottom of the screen like pinball flippers. The goal is to strike all of the colored pegs before you run out of balls, your supply of which replenishes with each new level. If you’re lucky enough to land your ball in a basket that caroms across the bottom of the screen, you’ll keep that ball in play for another turn. When you finally clear the screen of the orange pegs, you get what I consider to be one of the best payoffs ever in a casual game. The action slows down (a slow motion mode, if you will) and following a drum roll you hear a choir singing Beethoven’s Ode to Joy as the ball begins to sparkle and a rainbow appears on the screen. In place of the barrel at the bottom of the screen are several repositories; wherever your ball lands determines an extra bonus point value ranging from 10,000 to 100,000 points. It’s so absurdly over the top, it works perfectly. Each time you see it it’s hard to resist the urge to pump your fist in the air with satisfaction. The object: Fire a ball out of a cannon to make orange pegs disappear. There are a few things you can do to maximize your point score. As you eliminate orange pegs, a Fevermeter on the right side of the screen climbs and increases a score multiplier. You can also get style points for certain cool shots, such as a very long-distance rebound from one side of the screen to another. A free ball is awarded if you score 25,000 points on a single shot. Each level you successfully complete in Adventure Mode (where each level is played in sequence) can be played again in Quick Play Mode. The game also features a Duel Mode where you can play against another human who’s on the same Mac or against the computer. You take turns shooting the ball and try to outscore each other. What’s more, you’re penalized if you fail to hit an orange peg on your shot. You can play as any Peggle Master you’ve unlocked, thus activating their special power if you hit a PowerUp peg. It’s part pure action, part strategy, figuring out which Peggle Master’s power will serve you best. Four levels of difficult keep up the challenge. There’s also a Challenge Mode, a special gameplay mode that’s only unlocked when you complete the Adventure Mode. It’s designed to keep you playing long after you’ve beaten the basic game. Controls are optimized for a multi-button mouse with a scroll wheel (an Apple Mighty Mouse works but I prefer third-party options). You can make small adjustments to your cannon’s position using the scrollwheel, for example, and you can right-click the mouse button to speed up time. As many levels are animated, this can help you ease the wait for objects to move into position before you shoot. Options are basic. You can toggle full screen mode and adjust volume and sound effects. The game’s designers have also thoughtfully included a colorblind mode, for users who may not be able to see the same range of colors as others. Peggle Deluxe is one of the most fun and addictive casual games I’ve played in quite some time. You really have to try it. It’s worth the download.